Daria Vera, Efrain Carrara, Baldemar Diaz, Alex Moreno and Lupita Guzman, members of the Texas United Farm Workers Union and the 1966 Melon Strike, unveil a historical marker at the STC campus Thursday, Dec. 7, 2017, in Rio Grande City. RIO GRANDE CITY — The story may not be found among the pages of history textbooks, but the inception of the 1966 Farm Worker Movement will nonetheless be remembered with a historical marker unveiled here Thursday. 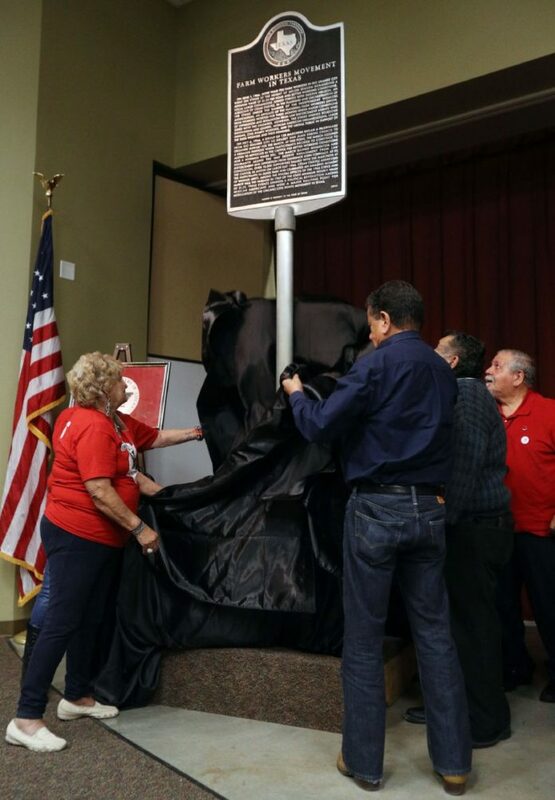 The Starr County Industrial Foundation, former members of the United Farm Workers Movement and members of La Union del Pueblo Entero — or LUPE — came together for the unveiling of the marker at South Texas College’s Starr County campus. The marker is meant to commemorate the demonstrations that occurred in Starr County more than 50 years ago and pass along those memories to people who weren’t alive at that time. On June 1, 1966, more than 700 farm workers in Rio Grande City went on strike to demand a minimum wage of $1.25 per hour, an increase from the 45 cents per hour they were being paid to pick melons. To draw more attention to the issue, on July 4, 1966 a group of 120 marchers began a more than 490-mile trek from Rio Grande City that ended in Austin on Labor Day, Sept. 5, 1966, where Cesar Chavez addressed them in Zilker Park. A handful of people who participated in those strikes were present at the unveiling to share their experiences with STC students. Daria Vera recounted how she, another woman and 14 men from California blocked the international bridge in Roma. At about 8 p.m., law enforcement arrived and arrested the men, Vera said, but she and the other woman remained until 11 p.m. when they too were arrested. Incidents of violent clashes with law enforcement at the time are well-documented, specifically with the Texas Rangers. As a result of those encounters, a 1974 Supreme Court case, Medrano v. Allee, limited the jurisdiction of Texas Rangers. To make this event a reality, Benavidez said she approached the STC board of trustees, and there was no hesitation among them to make it happen.